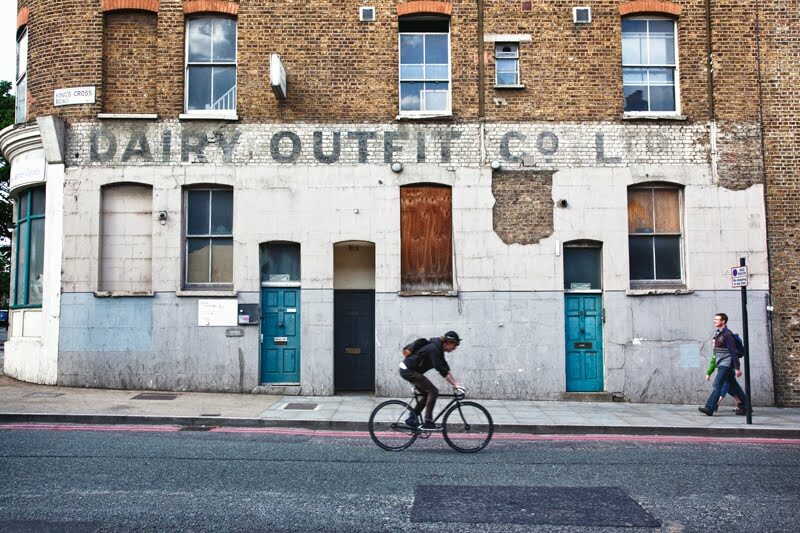 This image was taken as part of a project I'm working on showing the village aspect of London. Although the population of London is around 7.5 million, it is still in many ways just a collection of villages sitting side by side. A sense of community exists no matter what part of the city you live in. and it's the thing i love most about the city. it's like getting several towns for the price of one! I always thought that London was a big metropolitan. Didn't think that it is made up of villages. Mo, what an interesting project. Nice shot. Yes, fascinating project. Do you mean the inner-city or the Greater-City? The tag line of the government of the City of Sydney is 'a city of villages'. Did we nick that from you lot? We often do. The built-environment aspect of this image is full of nostalgia and works really well, but the image is 'made' by the energy of the two humans. Julie is so right. 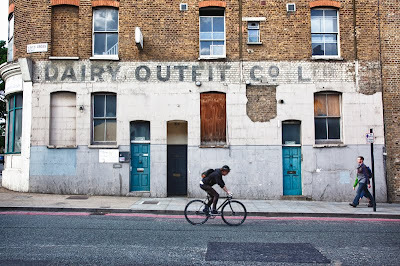 The building does evoke a bit of nostalgia but, the pedestrian and the cyclist make the shot. I kind of agree about the 'villages' feel of London. My husband's family are all East End born and bred. They mostly live and/or work close to the original family home and there is a sense of community amongst the long established. On the other hand, London is a very mobile population and can be a lonely, lonely place for some. I love these old faded signs! What a great project, Mo. I have heard it said of many big cities, like London and Paris, that they are collections of villages, and both do feel that way to me. This photo gets you an A in that class. Not what I imagined the Kings Cross Rd to look like! Looking forward to this project of yours, very much. I kinda got that small town feeling when I lived in Northolt for a while about 5 years ago. I would personally say London is more like a collection of small cities and big towns. And that sense of community I haven't seen it in Wembley, Shepherds Bush or Kilburn where I have lived. It may still exist in some parts of London but not everywhere. Great idea with your village project! One of many things I like with London, is the short distance to villages that are sooooooo nice to visit. I like your street photo, the composition, the location and the people also add something extra to your shot!